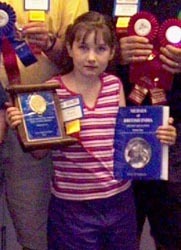 (left to right) Tim Henderson presented the Best of Show Award to Dorte Brace for her display "Saints and Their Stories on Byzantine Coins". 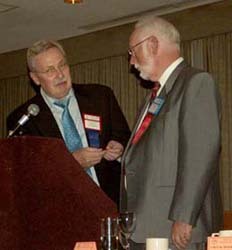 (left to right) Laurence Duncan, on behalf of Ian Hunter, accepts the Jerome H. Remick III Literary Award for the Best Newsletter Article from Tim Henderson. 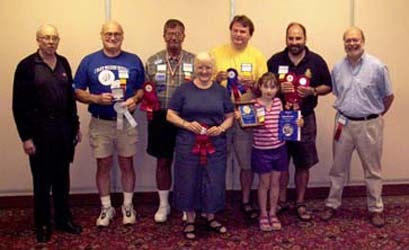 (left to right) Paul Petch, 2004 C.N.A. 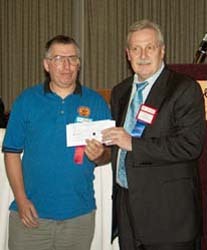 Convention Chairman presented the Guy Potter Literary Award for the best article in The CN Journal to James R. Bakes. 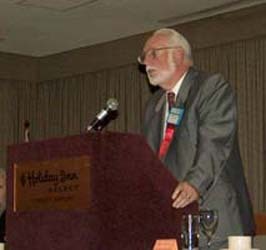 This presentation was witnessed by William McDonald, and took place after the convention. 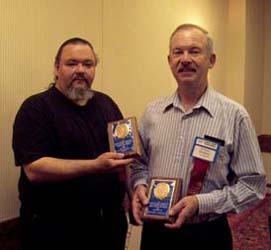 Bill Waychison, on behalf of Mid-Island Coin Club Numismatic Journal, edited by Wayne Jacobs holding the Best Local Newsletter Award. 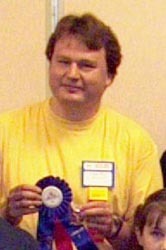 Robert Graham, editor of the Canadian Paper Money Society Newsletter holding the Best National or Regional Newsletter Award. 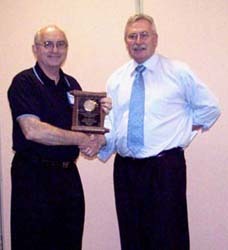 (left to right) Colin Cutler on behalf of the Windsor Coin Club received the Louise Graham Memorial Club of the Year Award from Charles Moore, President of the C.N.A. 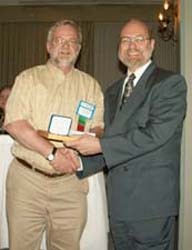 (left to right) Tim Henderson presented the Fellow of the C.N.A. 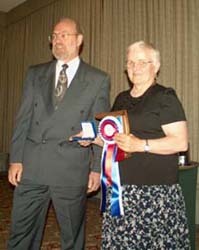 Award to George Fraser. 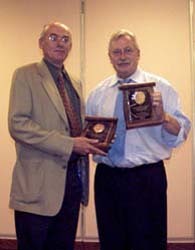 (left to right) Tim Henderson presented the Fellow of the C.N.A. Award to Dan Gosling. 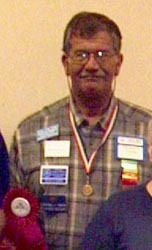 (left to right) Charles Moore, President of the C.N.A. 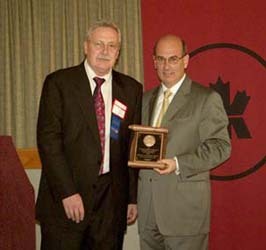 presenting the Royal Canadian Mint with a Presidential Award to David Dingwall, President and CEO of the Royal Canadian Mint. 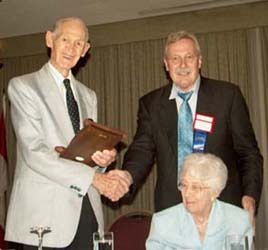 (left to right) James Charlton, Honorary C.N.A. 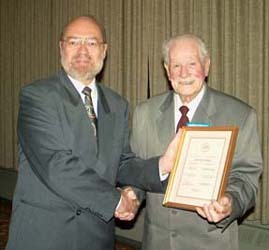 President received a Presidential Award from Charles Moore, President of the C.N.A. 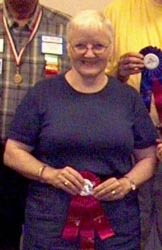 ; Mary Charlton. 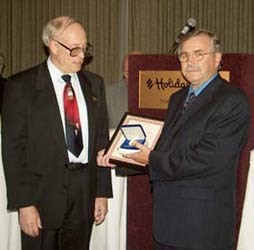 (left to right) Bret Evans, Associate Publisher and Paul Winkler, Publisher, (photo not available), Trajan Publishing Corporation were given a Presidential Award from Charles Moore, President of the C.N.A. 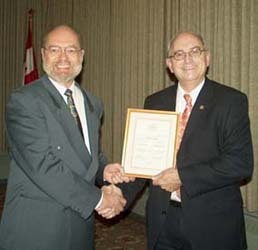 (left to right) Graham Esler gave the keynote banquet speech on the history of the Bank of Canada Currency Museum and received the Keynote Banquet Speaker Medal from Charles Moore, President of the C.N.A. 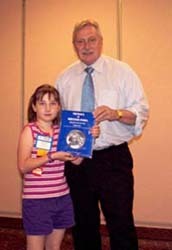 (left to right) Sabrina Boyer receiving a copy of Medals of British India by Robert Puddester from Charles Moore, President of the C.N.A. 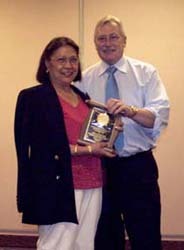 (left to right) Monina Regitko received a special appreciation award for clerical assistance to the Executive Secretary from Charles Moore, President of the C.N.A. 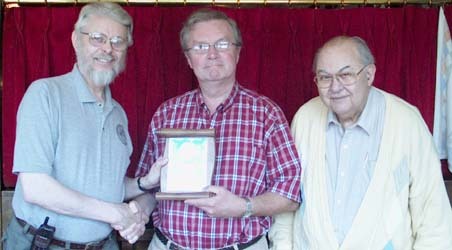 (left to right) Dan Gosling received a Special Appreciation Award for his work on the C.N.A. 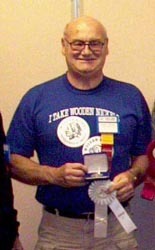 website from Charles Moore, President of the C.N.A.